They say that classics never go out of style. Wood blinds take this concept to new heights! Louvered blinds made their European debut in the mid-to late 15th century, and they have remained much the same as years, fads, trends, and tastes passed. Colonists in what would become the United States made a lasting impact on history – and they introduced the new world to Venetian blinds. That is a legacy that we are still living, enjoying, and using to preserve our furniture, today. Venetian blinds, wood blinds, or as the French say, “les persienes,” had their start in ancient Egypt, where Pharaohs had blinds made of reeds, and China, where they were made of bamboo. They were used in Persia, brought to Venice, and from there, the “Venetian” blind spread to homes all over the world. The appeal is universal: regardless of culture, architecture, time period, style, or budget, wood blinds are prized for their form and function. It is said that Thomas Jefferson insisted that each window in each house he owned must be outfitted with wood blinds. He was so enamored of them that he listed them in his will to be dispersed to beneficiaries. Jefferson was not alone; blinds were a very common feature in Colonial homes, and most people liked theirs sans drapery. While we would consider this an aesthetic choice today, it was a practical one then. Drapery, coming from England, was heavily taxed, in addition to being expensive (and still are today). Locally-made blinds made much more sense, and so became much more popular. Like the classic Little Black Dress and its fluctuating hemlines, wood blinds have undergone style changes over the years. Towards the close of the 18th century, for instance, designers began making lighter, more delicate blinds, and people started to choose white or natural paint colors over the traditional wood finishes. A few decades later, ornamentation was de rigueur, and blinds were often used as a protector and preserver while allowing decorative draperies to do the heavy décor lifting. The pendulum shifted once again, and blinds emphasized expert craftsmanship and clean design. 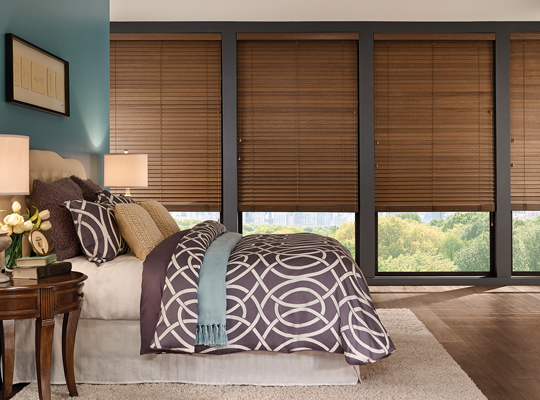 Today, wood blinds are available in a variety of colors and styles. From bamboo (a nice nod to Ancient China and its contributions to the blind’s history!) to basswood to premium hardwoods to faux options, like vinyl, they are still one of the most popular window treatments available. Wonderfully versatile, affordable, simple, and sophisticated, wood blinds offer tremendous value. This entry was posted in Uncategorized, Wood and tagged Andover, Blinds, Bristol, History, New London, Sunapee, Sutton, Wilmot.